Carroll County Government has invested $19 million dollars since 2007 to build, operate and maintain over 110 miles of fiber optic lines throughout the county. More than 130 local and state agencies are connected to the network including all county offices, Board of Education buildings and schools, Carroll Community College, the Carroll County Public Library system, emergency response facilities, court houses and town offices. Extra fiber capacity is leased to business through the county’s Fiber Network Enterprise Fund. Carroll County is part of the Inter-County Broadband Network (ICBN), a Maryland consortium including the City of Annapolis, Anne Arundel County, Baltimore City, Baltimore County, Harford County, Howard County, Montgomery County, and Prince George’s County. ICBN partners with the State of Maryland and the Maryland Broadband Cooperative to create the One Maryland Broadband Network. Carroll Broadband “middle-mile” fiber optic network expands internet service options in Carroll County’s cities, towns, and industrial areas. It provides cost-effective, high-bandwidth capacity to enable private carriers to bridge the last mile through their own investments to serve Carroll’s underserved businesses and residents. Carroll County leases dark fiber at competitive rates to encourage economic development throughout Carroll County. Additionally, the county established interconnect points with Baltimore, Frederick and Howard counties which provide connectivity to data centers (Major Carrier Hotels) in the region. Carroll County is committed to helping businesses improve their operations and has dedicated funding to support reducing the costs of internet connections in underserved and unserved areas of the county. For more information, see the Carroll Broadband Grant Program below. 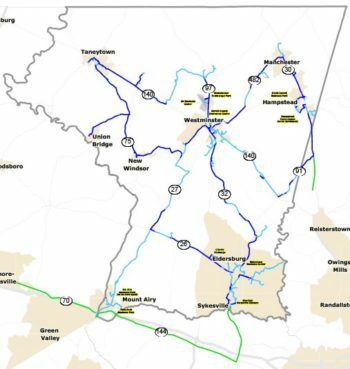 Carroll County Government leases the dark fiber to Internet Service Providers (ISP’s), in turn, ISPs provide the last mile connections and internet access through direct service contracts with the customer. To begin the process, download the Carroll Broadband Draft Master Lease Agreement. Leasing prices are quoted per strand/per month/per mile and will be listed in the lease agreement. The actual quoted price takes into account various factors, including but not limited to location of the fiber, footage of the fiber leased, length of the lease term, and number of fibers leased. To learn more about dark fiber leasing opportunities, please Mark Ripper (mripper@carrollcountymd.gov) at 410-386-2053. 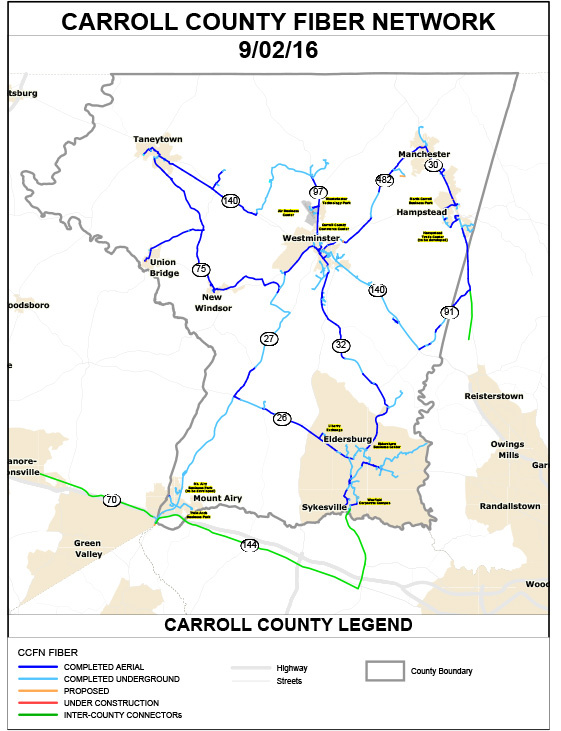 Carroll Broadband, an over 110 mile fiber optic network owned by Carroll County Government, serves both public and private customers throughout the county. The Carroll County Board of Commissioners committed to the expansion of this valuable infrastructure asset to serve more commercial/industrial customers. This expansion will meet unmet broadband needs and/or provide redundant services through various service providers. The Carroll Broadband Grant program was created to support further development through the Fiber Network Enterprise Fund. Any internet service provider that is in good business standing with federal, state and local government authorities that plans to provide service in an unserved or under-served area in Carroll County, MD. Grantees must have legal authority to provide, construct, operate and maintain the proposed facilities or services. Has unmet broadband needs in an underserved or unserved area of the county and/or requires internet service redundancy for business continuity purposes. What is an unserved or underserved area? Unserved is defined as not having access to a fixed internet connection with speeds of 10 Mbps download/1 Mbps upload. Underserved is defined as not having access to a fixed internet connection with speeds of 25 Mbps download/3 Mbps upload from two or more providers. Up to 50% matching reimbursement of qualified project expenses with a cap of $25,000 per approved project. A cap of $100,000 per entity or service provider is fixed per fiscal year and is dependent on allocations approved by the Carroll County Board of Commissioners. The construction, acquisition, or leasing of facilities or spectrum, land, towers or buildings used to deploy broadband service for business and residentially-based businesses located within Carroll County, MD. Mark Ripper, Chief Information Officer at 410-386-2053.